There's been a hole in the world since the NFL season ended. And it's not because football is over. It's because we have not been inundated with continuous stories, updates and speculation about Tim Tebow. But now, there's no longer any need to worry because Tim Tebow is moving his competitive spirit from the football field to the United States Patent and Trademark Office. The battle over the Tebow brand has begun! Sure, it may not as exciting as watching him complete nine of 26 passes for a total of 136 yards. Actually, maybe it is. Because now he's taking on multiple opponents at once! And his front line is made up of attorneys and trademark examiners--his Te-bros! OK, that sounds even geekier than I intended. Regardless, unlike the critics of his passing game, the critics here should agree that Tebow is going to run over his competition at the Trademark Office. Yes, that last one is TErriBOW. Luckily for Tebow, the Trademark does not grant trademark registrations to the first people who happened to file applications, there is an examination process. Starting with a no-huddle offensive strategy, Tebow's attorneys have already submitted “Letters of Protest" to the trademark examiners who will review these marks. The letters note, “[T]he applications of the third parties noted above were all filed as a result of the notoriety Tim Tebow has achieved this past fall as he became the successful lead quarterback of the National Football League franchse the Dnever Broncos." Legal translation: Mr. or Ms. Examiners, if you don't know who Tim Tebow is, we're going to summarize it for you. Tebow's attorneys also summarize why Tebow is so popular, “The notoriety encompasses his deep religious faith and the particular physical stance that he takes when he prays on the football field. That physical stance has been designated “TEBOWING." Legal translation: We'd say Tebow is a god if it wasn't a sin against our client's religion to say so. And if the Trademark Office thought Tebow might be sponsoring these imitators, his attorneys make it clear that Tebow does not, “Neither Tim Tebow nor the Tim Tebow Foundation have given their approval for such use, and, therefore, there is no bona fide ‘afiiliation, connection, or association' of the applicants with Tim Tebow, nor is Tim Tebow sponsporing these cited applicants in any of their activities." Legal translation: These guys Te-BLOW. So far, the Trademark Office agrees. It has initially rejected third-party filings for “TEBOWING" and “IT'S TEBOW TIME." As one Trademark Examiner noted, “Registration is refused because the applied-for mark consists of or includes matter which may falsely suggest a connection with Tim Tebow. Although Tim Tebow is not connected with the goods and/or services provided by applicant under the applied-for mark, Tim Tebow is so famous that consumers would presume a connection." Legal translation: Note how the Examiner says “so famous"? I think he meant “sooooooo famous." Here, the Trademark Office is doing its job correctly in rejecting these applications because they included “a name, portrait, or signature identifying a particular living individual whose written consent to register the mark is not of record." Legal translation: You can't get a free ride on someone else's reputation without that person's permission. To support the rejection, the Trademark Examiner cited to In re Hoefflin a case that a party could not register OBAMA PAJAMA, OBAMA BAHAMA PAJAMAS, and BARACK'S JOCKS DRESS TO THE LEFT because the applicants lacked Obama's permission. And, I think you'll agree with me, that last one should just be barred because, well, yeah. So what does this mean? It's IneviTEBOW, Tebow will win and be the sole owner of Tebow marks, including those marks for Tebow with trading cards. I have one concern though. 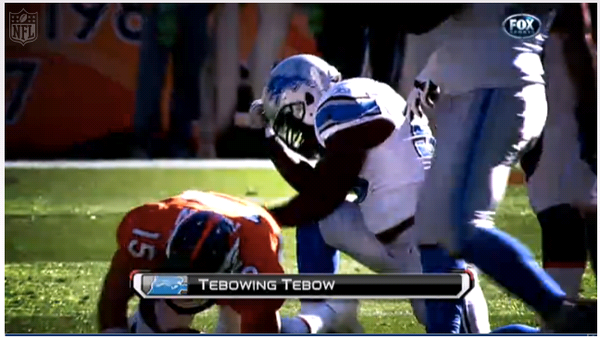 One of my favorite points of this NFL season was when Stephen Tulloch sacked, and then TEBOWED Tebow. Here's where a potential problem comes in. If Tebow owns the TEBOWING trademark, and asserts ownership over the TEBOWING stance, well, the next time someone sacks and then TEBOWS Tebow, the defensive player could be sued by Tebow for trademark infringement and trademark dilution. Legal translation: If you don't have permission, you can't use someone else's trademark. And if you do something to hurt the value of the trademark (like tarnish it by mocking it in front of millions of viewers), you could be liable for that too. Sounds like a professional wrestling storyline I know, but, it could happen. While Tebow should be able to run over his competition at the Trademark Office, I don't think he should be able to run over the competition that ran over him and then TEBOWED over him. Rest assured poor, defenseless NFL linemen. If you sack and then TEBOW Tebow, and he sues you later for trademark infringement, give me call. I'll take your case pro bono. Legal translation for NFL linemen: Pro bono is where a lawyer represents you for free.